Add Horsepower and Torque to Your Ford Gas Vehicle with Superchips' Dashpaq+ Today. Free Shipping! Ford gas vehicles are some of the best selling cars, trucks, and SUVs on the market today. In fact, data indicates that an F-150 is sold every 30 seconds! The impressive number of Ford vehicles on the road today leads to tremendous demand from consumers looking to accessorize and upgrade their driving experience. Superchips has specialized in performance programming for 35 years. The Dashpaq+ provides Ford vehicle owners with the opportunity to equip their F-150, Mustang, Expedition, or other vehicles with various pre-loaded power levels, user-controlled features like tire and gear options, and real-time data monitoring. F-150 gas truck performance programmers can add power, torque, and fuel economy. So why the Dashpaq+ for your F-series truck? The experts at Superchips engineer reliable power designed to not only impress, while on the dyno, but more to assure our consumers that a safe, reliable, and meaningful power is provided across the RPM Band. Our team of performance-oriented engineers packages power to the rear wheels, but with special attention to engine components and the longevity you expect out of your Ford gas truck. 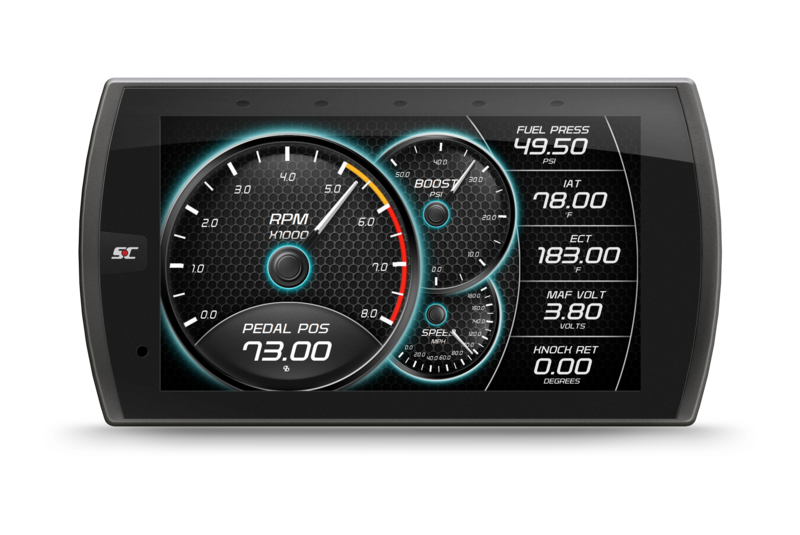 The Dashpaq+ will offer you real-time insight into your engine’s performance. After selecting your preferred power level, you can configure your screen layout however you prefer. This is where the customization and additional features clearly set Dashpaq+ apart from our own Flashpaq performance tuner and other tuning providers in the space. Keep a close eye on boost, transmission temperature, and more. Your options are abundant and the before and after difference with the Dashpaq+ installed will leave you impressed! Putting close to an additional 40HP to the wheels on a Mustang is, needless to say, fun! Dashpaq+ comes loaded with extensive Ford Mustang coverage including the GT500 and Ecoboost engines. Mustang owners enjoy the option to customize their rides and Dashpaq+ enables just that – loads of customization options! While adding horsepower and torque is fun however you look at it, we’re well aware that Mustang owners may very well be taking things to the next level with headers, exhaust systems, and more. Superchips has included the option to load custom tunes directly to the Dashpaq+ performance programmer and monitor. Now, you can not only take advantage of pre-loaded performance levels, but you can work with an authorized 3rd party custom tuner to engineer a tune just for your particular set up. Use Dashpaq+ to log data, work with a custom tuning provide to tweak and adjust tuning until you are dialed in for however far you’ve taken your Mustang “build”.